Posted April 29, 2015 by laurielmorrison & filed under Middle Grade Literature, Posts about pedagogy, Read Aloud, Teaching. 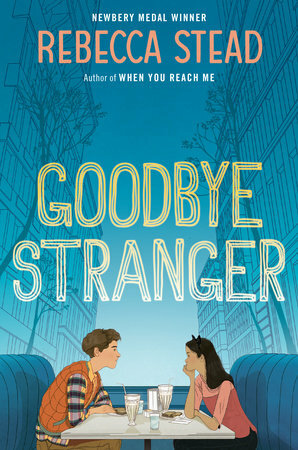 At the end of lunch a couple of weeks ago, a group of seventh grade students called me over to their table to tell me that they’d been talking about our read-aloud novel, Goodbye Stranger by Rebecca Stead, which will come out this August, and they had a suggestion. On double period days, we should read aloud for twice as long as we do on regular days because they were so eager to find out what was going to happen. Then, during class that afternoon, I tried to stop after a particularly juicy chapter ending, and everyone begged me to keep going. That’s exactly the way I want read alouds to go. I want students to be excited to talk about our read-aloud books and to look forward to the next chapter. And I’m especially happy that Goodbye Stranger has been so popular because at first I wasn’t sure whether or not I should use it. That’s not to say that I didn’t immediately fall in love with Goodbye Stranger, because as soon as I got to read an advance copy, I did. I adore the cast of well-developed characters and the poignant friend and family dynamics. I’ve used Rebecca Stead’s last two novels, When You Reach Me and Liar and Spy, as read alouds in the past, and Goodbye Stranger includes a lot of the same features that made those other two books work so well to read aloud: beautiful writing, lovable characters, thought-provoking ideas, and a puzzle for readers to work out. But When You Reach Me and Liar and Spy appealed equally to boys and girls, and when I first read Goodbye Stranger, I wondered whether boys would like it as much as girls would. A lot of the novel is about the changing friendship dynamics of three seventh grade girls–Bridge, Tab, and Emily–as Tab discovers feminism and Emily starts to get a whole lot of attention from an eighth grade boy, and I wondered if the novel would be as much of a whole-class crowd pleaser as I wanted it to be. When I stopped and thought about it, though, I realized that there was plenty in this novel that would engage the whole class; there’s a mystery high school character who slowly reveals why she is so upset that she’s skipping school on Valentine’s Day, there’s a boy who can’t understand why his grandfather left his grandmother and his whole family out of nowhere, there’s a girl trying to make sense of what it means that she survived a terrible accident even though medical professionals told her she shouldn’t have, and there’s some powerful exploration of the kind of peer pressure and bullying that can happen over texting and social media. It’s an excellent book, and I believed that it was worth sharing. A week or so after we started Goodbye Stranger, author Shannon Hale wrote a powerful blog post called No Boys Allowed: School visits as a woman writer. This post has rightfully received a whole lot of attention, so you may have seen it already. In the post, Hale describes her experience visiting a school where she presented to all of the elementary school students but only the girls from the middle school; middle school boys were not excused from their regular classes. One middle school boy who had loved one of her books got special permission to attend, but he was too embarrassed to come. 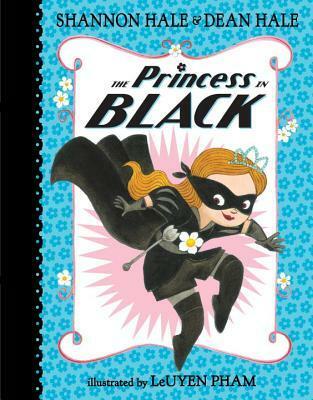 And another elementary school boy wanted to wait until everybody else had left–even his teachers–before asking Hale if she had a copy of The Princess in Black, the book she had read from at the end of her presentation. This school had sent a message to boys, loud and clear: they were not supposed to want to read books about girls, written by female authors. Excluding boys from a female author’s presentation is an extreme example of a problem with the way we present reading options to boys and girls. But Hale also discusses subtler examples: “[W]hen giving books to boys, how often do we offer ones that have girls as protagonists? (Princesses even!) And if we do, do we qualify it: ‘Even though it’s about a girl, I think you’ll like it.’ Even though. We’re telling them subtly, if not explicitly, that books about girls aren’t for them. Even if a boy would never, ever like any book about any girl (highly unlikely) if we don’t at least offer some, we’re reinforcing the ideology.” She then points out that while lots of people might tell boys they’ll like The Hunger Games “even though” it’s about a girl, people probably wouldn’t tell girls they’ll enjoy the Harry Potter books “even though” Harry is a boy. Reading that part of Hale’s post, I realized that I was guilty of some of that same thinking; I had questioned whether or not boys would like Goodbye Stranger since parts of it are about female friendship dynamics, but I probably wouldn’t have questioned whether or not girls would like a book about male friendship dynamics. And as Hale explains, that kind of thinking suggests that the male experience is somehow more universal and more important than the female one, and it contributes “[t]o a culture that tells boys and men, it doesn’t matter how the girl feels, what she wants […]. No one expects you to have to empathize with girls and women. As far as you need be concerned, they have no interior life.” Clearly, this is not the message anyone wants to send. It’s not fair to boys or to girls. After reading Hale’s article, I was feeling relieved that I’d gone ahead and chosen Goodbye Stranger for our read aloud, but then we reached a scene in which two female characters, Tab and Em, have a disagreement. In the scene, Bridge, Tab, and Em, three of the book’s main characters, are in a convenience store, brainstorming ideas for their Halloween costumes, and an eighth grade boy named Patrick walks in with some of his friends. Patrick and Em have been texting each other increasingly daring photos of themselves, and Bridge and Tab don’t understand what Em is doing and think she should stop immediately. Patrick’s last photo was of his bedroom doorknob, and when Patrick walks over to the girls, Tab says, “Nice doorknob.” As soon as Patrick and his friends leave the store, Em gets angry with Tab. When we finished reading that chapter, one student said he thought Em had overreacted when she got mad at Tab for mentioning the photo to Patrick. Other students immediately jumped to Em’s defense, explaining why she was so embarrassed by Tab’s comment and why Tab should have known better. As we debated the issue, it became clear that most of the boys in the class thought Em had overreacted and most of the girls in the class took her side. We talked about why that might be, and it came out that more of the girls in the class could relate to Em. Prompted by that conversation, I shared Shannon Hale’s blog post with the class. The students were surprised to read about Hale’s experience, and as we talked about the article, one student’s comment really struck me: “Relating to a book and liking a book aren’t the same thing. I don’t need to relate to something to like it.” So even though some of the boys didn’t really relate to Em, that didn’t mean they weren’t as into the book, or that they were getting any less out of reading it. And actually, that scene led the class to talk about some pretty important ideas: things like how much confidentiality we expect when we share a secret with a friend, and what happens when somebody thinks they’re teasing but they’ve still done something hurtful, and how it feels when we trust someone and then feel that they’ve betrayed our trust. It was a valuable conversation for everyone in the room, male or female, middle-school-aged or adult. For me, that conversation emphasized that we do everyone a disservice when we assume that boys won’t enjoy or benefit from reading books that focus on female characters and are written by female authors. In a book as layered as Goodbye Stranger, different readers can find different aspects to connect to, and even if there are some elements that some readers don’t connect to, that doesn’t mean that the book isn’t for them. We need to trust that kids can select the books they want to read without confusing the matter by telling boys that certain assemblies aren’t for them, or by creating book covers that appeal to some potential readers but alienate others. And we need to trust that good books are good books, period. Oh man! Excellent post, Laurie! What a great issue. I hadn’t read Shannon’s post until you mentioned it. Her experience made me physically ill. I don’t see how the school could justify that exclusion. But as you said, we all have probably qualified books in some way (but not others, like Harry Potter). Such a good point about covers, L. Marie! This post was already so long that I only hinted at the issue of covers that seem to signal “for girls only” at the end, but you’re so right.